Hourly collection Turbine Special Editions, entirely devoted to gambling and entertainment, continues to inspire the company Perrelet to create unusual and creative innovations. If the first models of the collection look riveted to the rotor with 12 blades, which is hidden under the dial with a specific decor, the novelty Turbine XL Paranoia, in 2012 the Swiss watchmaker Perrelet, by “infernal spiral” in the rotor creates an optical illusion of swirling universe a surreal interpretation of where the line between reality and the imaginary world. When the spiral is set in motion, with a consistently expanding and rolling, quite literally a few minutes to hypnotize look and change the way about the world. At night, the “show” on the dial is amazing, as she spiral markings in the form of Arabic numerals and hour markers, coated with white luminous material Superluminova, rapidly spinning in the dark looking at a clock face and long may simply lead to paranoia. 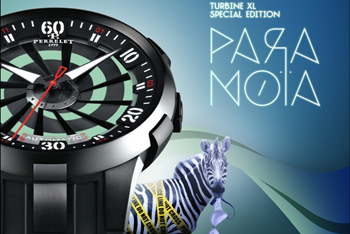 Turbine XL Paranoia model has a round steel case with DLC-coated black. Waterproof to 50 meters, case diameter of 50 m and a thickness of 14.30 m is equipped with a front anti-reflective sapphire crystal. Operate at clock manufactory automatic mechanism P-331, with double rotor automatic winding. Time display performed by central arrows hours, minutes and seconds. New Turbine XL Paranoia equipped with rubber strap in black. Buy watches Turbine XL Paranoia through our authorized representatives of the company at a price of Perrelet 5450 euros. Jackie Chan with Urwek UR-202 AlTiN wrist in the movie CZ12!